My laboratory explores the how’s and why’s of physiological design. Our primary physiological system is the digestive system, where we investigate the integrative design of gastrointestinal morphology and function. Our projects fall under two long-term interests; (1) the adaptive interplay between feeding habits and digestive physiology, and (2) the integrative mechanisms underlying the regulation of physiological performance. For the former project, we take a broad comparative approach using fishes, amphibians, and reptiles to explore the adaptive link between natural feeding frequency and the capacity to regulate gastrointestinal performance. The second program uses the Burmese python as an innovative model to investigate the signals and cellular pathways involved in the plasticity of tissue structure and function in response to feeding and fasting. Our evolutionary studies on gastrointestinal design and responses are aimed at describing why there exist a clear dichotomy in the regulation of gastrointestinal performance with feeding and fasting. From our studies of over 50 species of fishes, amphibians, and reptiles, we have found that species that feed frequently in the wild regulate their intestinal performance very modestly, whereas those species that naturally experience long intervals between meals regulate their intestinal performance over much greater ranges. Interestingly, this capacity to widely regulate intestinal performance has independently evolved several times. We proposed that energy conservation during fasting has been the selective pressure underlying the evolution of the wide regulation of gastrointestinal performance for infrequently feeding vertebrates. Using the Burmese python as our primary model we are exploring the integrative signals, cellular, and molecular mechanisms that underlie the remodeling of tissue form and function. Key questions are: how does the python shut down gastric acid production after feeding, what is responsible for the rapid postfeeding growth of the intestine, liver, pancreas, and kidneys, and what processes are involved in the wide regulation of intestinal function. Python exhibits the unprecedented response of doubling the mass of organs and rapidly lengthening their microvilli with feeding. 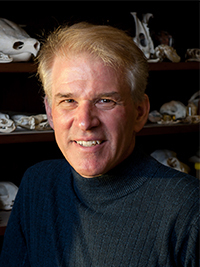 Our collaborative projects, enhanced by our publication of the Burmese python genome, examine the cascade of molecular and cellular events that underlie the reversible remodeling of tissues each time the snake eats. I welcome collaborations with other researchers on projects in digestive physiology, metabolism, and tissue plasticity, and I encourage undergraduate and graduate students and post-doctoral researchers to join my lab and become involved in an exciting series of current and future studies. Secor S.M., H.V. Carey. 2016. Integrative physiology of fasting. Physiol. 6:773-825. Andrew A.L., D.C. Card, R. P. Ruggiero, D.R. Schield, R.H. Adams, D.D. Pollock, S.M. Secor, T.A. Castoe. 2015. 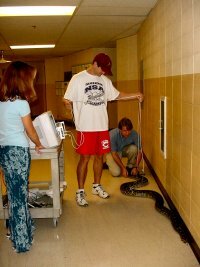 Rapid changes in gene expression direct rapid shifts in intestinal form and function in the Burmese python after feeding. Genom. 47:147-157. Castoe T.A., A.P.J de Koning, K.T. Hall, D. C. Card, D.R. Schield, M.K. Fujita, R.P. Ruggiero, J.F. Degner, J.M. Daza, W. Gu, J. Reyes-Velasco, K.J. Shaney, J.M. Castoe, S.E. Fox, A.W. Poole, D. Polanco, J. Dobry, M.W. Vandewege, Q. Li, R. Schott, A. Kapusta, P. Minx, C. Feschotte, P. Uetz, D. Ray, F. Hoffman, R. Bogden, E.N. Smith, B.S.W. Chang, F. Vonk, N.R. Casewell, C. Henkel, M.K. Richardson, S.P. Mackessy, A.M. Bronikowski, M. Yandell, W.C. Warren, S.M. Secor, D.D. Pollock. 2013. The Burmese python genome reveals the molecular basis for extreme adaptation in snakes. Natl. Acad. Sci. 110:20645-20650. Secor, S.M., J.R. Taylor and M. Grosell. 2012. Selected regulation of gastrointestinal acid-base secretion and tissue metabolism for the diamondback water snake and Burmese python. Exp. Biol. 215:185-196. Riquelme, C.A., J.A. Magida, B.C. Harrison, C.E.Wall, T.G. Marr, S.M. Secor and L.A. Leinwand. 2011. Fatty acids identified in the Burmese python promote beneficial cardiac growth. Science. 334:528-531. Secor, S.M. 2009. Specific dynamic action, a review of the postprandial metabolic response. Comp. Physiol. 179:1-56. Secor, S.M. 2008. Digestive physiology of the Burmese python, broad regulation of integrated performance. Exp. Biol. 211:3767-3774. Secor, S.M. 2005. Evolutionary and cellular mechanisms regulating intestinal performance of amphibians and reptiles. Comp. Biol. 45:66-78. Secor, S.M., D. Fehsenfeld, J. Diamond, and T. E. Adrian. 2001. Responses of python gastrointestinal regulatory peptides to feeding. Natl. Acad. Sci. 98:13637-13642. Secor, S.M. and J. Diamond. 1998. A vertebrate model of extreme physiological regulation. Nature 395:659-662.